It’s been a good five years since the release of HALO 3 and since then Microsoft have lost their previous developers Bungie put together a team of the best developers and called them 343 industries, and given them until 2012 to come up with an epic sequel to their much anticipated 2007 release. We first saw HALO 4 at E3 in 2011 but this year we saw the big reveal and this one promises to be different. The game follows on from HALO 3 with Master Chief and Cortana on the derelict ship Forward into Dawn. The E3 game play trailer showed us the UNSC’s ship Infinity crashing onto Requiem being pursued by a strange glowing orb that also has with it some non organic creatures that Master Chief comes across through out his missions known as the Promethians. 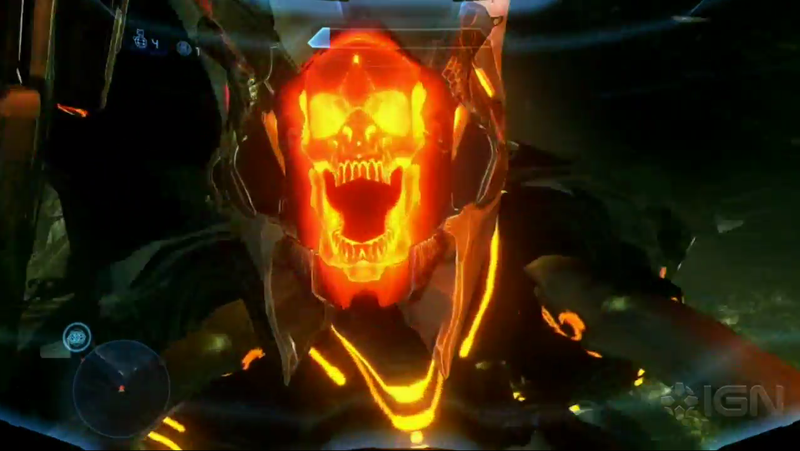 The Promethians will be taking over the role of the main enemy from the Covenant and have been described as an “ancient evil” that takes on new forms. The E3 game play footage showed some rather creepy looking creature that’s mask comes apart to reveal a rather gaunt looking orange glowing skull. The creatures also have the use of Forerunner weapons that take on different shapes and configurations, one weapon was seen to completely destroy an AI opponent with a shot similar to a SPAS shotgun. The Covenant will still have a role in the game but no-one knows why as yet. HALO 4 is said to be the first game in a trilogy named The Reclaimer Trilogy and both HALO 5 and 6 have been confirmed for this series. What’s probably going to be a big hit is their Spartan Ops. Spartan Ops is set to be a 10 week series of missions for up to 4 players and is exclusive to HALO 4. Each week 343 Industries are going to release a new mission that has it’s own story. Spartan Ops begins on the release of HALO 4 and has 5 missions, the week after, another 5 giving us a total of 50 missions per 10 week period (seasons). Oh and don’t worry, these aren’t some exclusive £16 DLC, these are free of charge! HALO 4 is probably going to be one of the biggest hitters this year, and with the release of some other great games and consoles, this year is going to be a good one for console gaming! Previous articlePocket Planes now available on iOS and coming to Android in the summer! Halo: Live Action TV Series Greenlit, Finally.